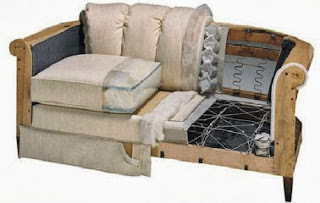 Rousseau's Fine Furniture and Decor: Don't judge a sofa by its cover! Love The Space You Live In! Don't judge a sofa by its cover! Get to know what’s inside before you buy! Have you ever wondered why two identical sofas can vary so much in price? 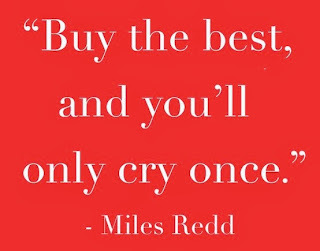 Quality goes deeper than looks; the secret is what lies inside! There are four components that impact the quality, longevity and price of an upholstery piece: The Frame, the Support System, the Seat & Back Cushions and the Fabric. The best frame is made of kiln dried hardwood. The process of kiln drying removes all moisture from the wood, leaving it extremely hard and stable for decades of sturdiness. Harden and Wesley Hall’s lines of sofas and chairs are a great example of this gold standard. If you are after a good sofa, look for a frame that’s constructed of engineered hardwoods with glued, dowelled and screwed joints and reinforced with corner blocks for extra support. This type of frame will last you a long time, even if you have kids jumping on it from time to time. In entry level sofas, you’ll often see particle board or plywood frames, and instead of joints, the corners are glued and stapled. These sofas may look good on the outside, but the reality is that the frame will crack in no time. Tip: Find out about the warranty on the frame, lifetime warranty is standard on a well built sofa. When it comes to support, the best is the eight-way hand tied springs system. It is a labour intensive technique where each spring is set into the deck webbing, then tied and knotted together in 8 different directions with upholstery twine. With this Cadillac of spring system, your sofa will have nice bounce and support. A good sofa will have sinuous spring or no sag system. Some of today’s slender sofas will have sinuous spring systems built in as it requires less space. The S shaped springs are supported by cross wires for a strong and consistent seat. Tip: Spotting the support system in a sofa is easy. Simply lift up the cushions and feel the springs in the seat deck when you are testing your next sofa. Filling for the seat and back is a personal but very important choice as the cushions separate you from the springs. Great sofa manufacturers like Lee, Wesley Hall and Harden have several fill choices ranging from all down to foam/down blend to high density foam. Down filled cores may be the most luxurious but they do require daily fluffing. Your next best bet is high-density foam wrapped in down or soft fiber, which maintains its shape and feels luxurious at the same time. For firmer support try for Lee’s Spring Fiber seat or Harden’s Spring Down seat which has an innerspring core, encased in foam and finished with a soft wrap in 100% cotton cover. Tip: To get the best seat that is right for you, take the time to test your options. Seat cushion packages can add to the base price of a sofa, but upgrading to your preferences is your best investment for customized comfort! Choosing the fabric is the fun part of sofa shopping, but before you commit, consider the amount of use your sofa will endure and the way you live. Fabric grades can have a big impact on the bottom line of your sofa or chair, but don’t skimp on the fabric. Choose high performance fabrics for the family room sofa with high Wyzenbeck rub count. If you fall in love with a patterned fabric, great manufacturers like Wesley Hall will make sure that the pattern is flow-matched from top to bottom. A sign of good quality is bias welt on seat and back cores; this ensures the fabric won’t ripple. Make sure both sides of the back and seat cushions are upholstered in fabric so you can rotate them to extend their life. Top 5 tips for buying your next sofa. 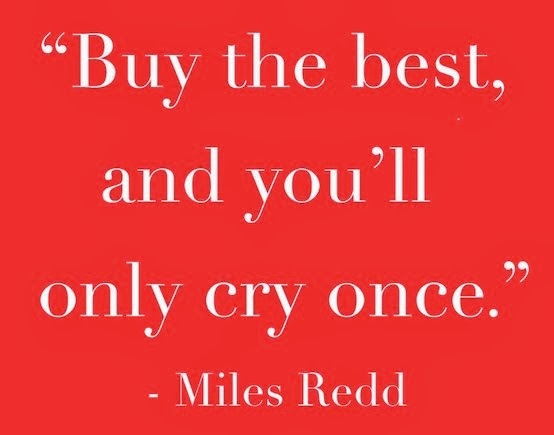 #1 Buy the best you can. #2 Ask to see the sofa’s construction. #3 Find out about manufacturer’s warranty. #4 Test various seat and back fill options. #5 Ask for the fabric durability rating.